I also don’t consider myself a foodie, so I was a bit surprised when I was actually selected for a FAM tour in Fort Lauderdale before TBEX last month. Then I realized that if you ask me for suggestions for any destination ever (that I’ve been to), 90% of my recommendations are for restaurants and bars. I may not be a professional connoisseur, have a developed palate, or understand the technical and artistic aspects of food, but I do pay attention to it. Fort Lauderdale wanted me to pay attention, and so I would. *FAM Tours, for you non-travel blogger form, are “familiarization tours,” where destinations bring groups of press/bloggers/media folk together to give them a crash-course about the destination. Here’s what I learned. Fort Lauderdale is by the Sea. 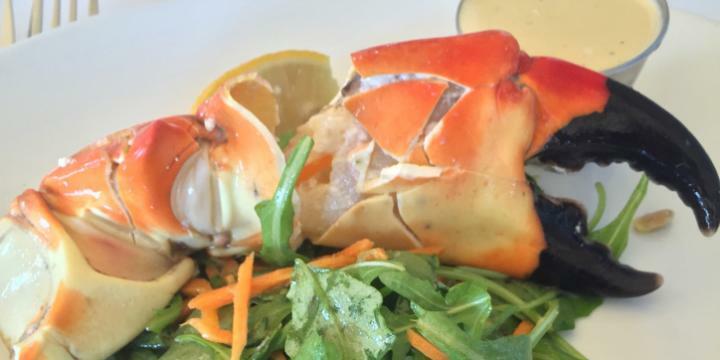 Buttery and indulgent Stone Crab claws, such as at Blue Moon Fish Co..
Night-sky black squid ink pasta with shrimp, like at Louie Bossi’s Ristorante. Fort Lauderdale knows Luxury Tourism. I became the Key Lime Pie girl in our group always ordering it, including the sweet version at Blue Moon Fish Co. and the Oreo crumble crust version at Beauty & the Feast. Lemon sorbet with sea salt was a perfect treat from Kilwins after our foodie walking tour. Watching the moon rise over the ocean while enjoying apple pie crumble or chocolate chunk brownie s’more from OCEAN2000. Fort Lauderdale is in the South. Cuban sandwiches are a must when visiting Florida. I found two great ones at El Tamarindo Cafe and surprisingly, Day Market Kitchen within stone’s throw of the convention center. I think the best meal I had was at Tom Jenkins BBQ, a hole-in-the-wall family restaurant coming up on 30 years in the business — 30 years of doing it right with hush puppies and succulent barbecue ribs. Brunch is a good indicator of a city’s restaurant scene; O-B House is spot on with deep-dish “pan-cakes” (made in a pan) and some of the best bread I’ve eaten… elevating their breakfast sandwiches. Fort Lauderdale is on the Cusp of Hip. If possible, I would have spent every night at Stache drinking their outrageously good cocktails among the leather couches and wood panelling. We had the chance to take a mixology class here too, which I’d highly recommend if you can find it. At Brew Urban Cafe, I came around a corner in an otherwise non-descript art studio to discover a secret cafe where I would work and drink coffee every day if I were Fort Lauderdale based… now I’m selling myself on the idea! The Craft Beer Cartel is bringing craft beer to this part of South Florida, which is really exciting for a beer lover such as myself. If you too love the hops and barley beverage, their shop offers local and “imported” beer from around the country and world. Fort Lauderdale has a diverse dining scene that is going to develop a lot in the next few years: as more Millennial travelers become families and start looking into the cruise industry as part of their yearly travel investment, I think smart chefs and restaurateurs will respond with increasingly innovative restaurants and bars. The great classics will endure, and new, irreverent ones — such as Fork & Balls and YOLO — will gain tenure, and join their ranks. Instead of taking a taxi straight from the airport to the cruise port, add a day or two to your itinerary to enjoy the different foods you can find. I think, like me, you’ll be pleasantly surprised. Many thanks to Fort Lauderdale for hosting me during the first few days of my trip, and treating me to many of the restaurants highlighted in this guide. To learn more about Valerie & Valise, click here.